It’s a brisk, gray November day. My gaze wanders around the paddock at Virginia International Raceway. It was a day much like this one that I first drove VIR in my Mazda6 (exactly three years prior to this posting). As then, I’m here with TrackDaze, only this time I’m doing hot laps in somebody else’s car. I arrived in the driver’s seat of a 2011 Genesis Coupe 3.8 R-Spec, but I’ll be leaving in the passenger seat of a tow truck. I look down, my thumb hovering over the the send button on my phone. I re-read the message I’ve prepared for my friend and instructor, still trying to absorb the magnitude of what has happened. I’ve had my share of off-track excursions (“gone agricultural,” as we like to say). I’ve put my Miata off at Summit Point Main Course (backwards) and I’ve put wheels in the dirt at Shenandoah in my Mazdaspeed3 on at least two occasions. It happens; it’s a natural byproduct of high-speed driving. Sometimes you find a quicker corner entry and carry a little more speed than you’d counted on. No big deal. You go back to the paddock, knock the dirt out of your brake calipers, and head back out. Part of learning is making mistakes. But this is different. I didn’t make a mistake. Nobody did. Well, nobody at the track, at least. My last session ended the same way everybody else’s did. The checkered flag came out, I took my cool-down lap, and I pitted in. In fact, I can still remember my last clear impression before I shut the car down in the paddock: Nissan should be worried. But when I tried to fire it back up for a lunch and gas run, the 3.8L V6 refused to catch. The dash lit up and the starter whirred enthusiastically–too enthusiastically–but nothing came of it. Great. I killed the flywheel. But how? I shrugged his comment off initially, but with a four-hour drive ahead of me, it was only a matter of time before I was mulling it over. Yes, Hyundai has come along way. Yes, the Genesis felt amazing out there–maybe not blisteringly fast, but it had enthusiast feel in a way a lot of other modern sporty cars don’t. But with the benefit of hindsight, the flaws start to bubble to the surface, too. The shifter, for example, is a mess. It’s light–almost limp–which could be forgiven if everything else were up to snuff. But it isn’t. The throws aren’t particularly long, but gears are simply physically too far apart. If the Genesis Coupe had Ferrari- or Audi-style gated shifter, I swear to you, there would be a full two inches between each notch. There’s so much dead space, in fact, that it’s sometimes difficult to tell whether you’re being locked out of a ratio by the ECU or you’re simply slamming the shifter into an area between gates, and with so little heft in the knob, you can’t rely on momentum to get you where you need to go. Aside from that blunder though, the Coupe does just about everything else properly. On the street, the steering is quick and well-weighted. The ride is firm, harsh over some bumps (The R-Spec comes standard with the track suspension and 19″ wheels, mind you), but never overly punishing. Turn-in is quick and feedback is good for a modern car. Lift provokes predictable oversteer which can then be caught and modulated with the throttle. When it comes to the dynamics of sporty driving, Hyundai nailed it. But somehow they forgot the fast. The sensation of driving the Genesis Coupe in anger is more like that of driving a sport sedan than a true sports car. The seating position is low, but the cockpit is airy and open. There’s no feeling of being enveloped by the car. The dash is flat, wide and deep, a reminder of the platform sharing that brings you both a luxury sedan and a sports coupe with only a significant change in wheelbase. And while other manufacturers have been fairly successful with this formula, namely Nissan/Infiniti with the Z and G, they’re starting with a smaller sedan and gutting the rear seat altogether, rather than simply putting the whole thing in a vise and smashing it down to a more performance-appropriate size. As a result the Genesis feels big even though it drives small. Even the power train feels better suited to a GT car than a sporty coupe. Unlike the RX-8’s buttery-smooth rotary or the 370Z’s frenetic V6, the 3.8L under the hood of the Coupe is rather anonymous and isolated from the driver. It conveys absolutely no sense of urgency. Even as you approach its ~6500-rpm red line, there’s no sense of occasion. You’ve simply run out of gear, and it’s time to begin the frustrating task of finding another. What little exhaust noise you get is pleasant, but it’s not the kind of note that encourages you to detour into tunnels or under bridges just to roll the windows down. On the track, the chassis is composed and predictable, the 245/40R19s in the rear keeping everything under control. The Brembo brakes delivered lap after lap of reliable stopping power, with only the slightest hint of fade late in the session, likely due to the sheer heft of the wheel/tire combination they’re tasked with clamping. Dynamically, everything checks out, but the quality of the chassis only serves to make the weaknesses in the power train show through. In two sessions (~12 laps), I managed to find second gear only once for the exit of Oak Tree (turn 12), and even then, the ECU flat-out refused to give me throttle control immediately after engaging the clutch. The 3.8L offers up enough torque to dig out of Oak Tree in third, but you’ll suffer for it in overall top speed, which is a major no-no in the single fastest section of the course. A car that can’t put the power down coming out of Oak Tree is like an NFL kicker who can’t hit from inside 30 yards when the game is on the line. It doesn’t matter how good you are everywhere else; this is where it counts. Those frustrations aside though, the Genesis Coupe still made a pretty strong first impression, and I was confident that I could work around the flaws and massage my technique to extract a few nasty-quick laps by the end of the day. Little did I know at that point that my day had already ended. I never saw the car again. Later in the week, I finally got some closure on the car’s no-start. Apparently, at some point, the transmission had been removed and disassembled. In the reassembly process, either the wrong bolt was used or the wrong torque was applied, but the bracket holding the starter motor was not secured properly. At some point during my second on-track session, the bolt parted ways with the rest of the assembly, leaving the starter hanging from its wiring harness, where it whirred dutifully but fruitlessly against nothing at all when I tried to summon the car to life again. Good thing I didn’t stall it on course. If you’ve read this far, you’re probably trying to decide whether this is a half-baked review, or a review of a half-baked car. Both are probably accurate to some extent. I find the Genesis Coupe to be an outstanding first effort from a company that is playing the fastest game of catch-up the industry has seen since Lexus in the early-mid 1990s, but it’s far from perfect. To fall back on my earlier sports analogy, I’d classify the Genesis Coupe as a rookie with solid fundamentals, but poor form. With some conditioning and guidance, Hyundai has a serious all-pro contender waiting in the wings. Until then, I feel I can pretty safely echo my friend’s insightful response to my predicament. Indeed, the Koreans don’t seem to be ready to take over the world just yet. We’ll explore that a bit more with part II of this story later in the week, when we take a look at the Hyundai Sonata and Kia Optima. Stay tuned. 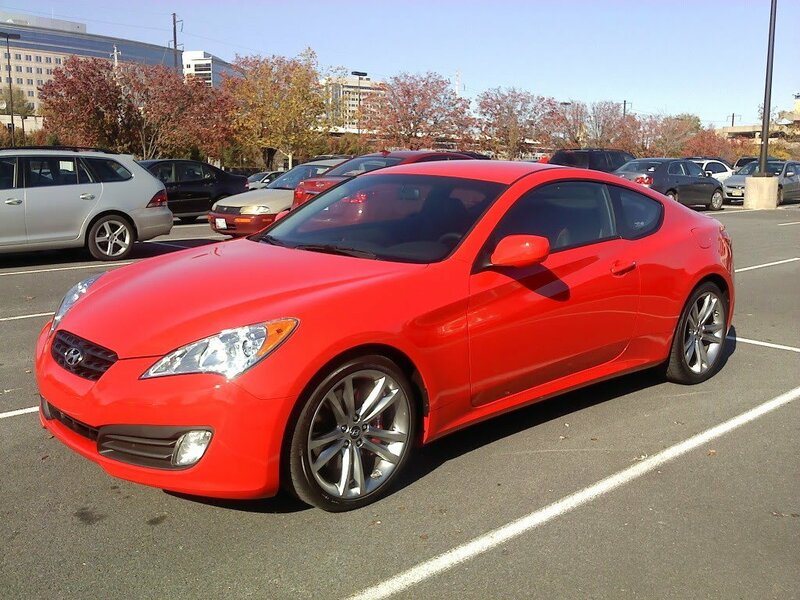 Hyundai provided the Genesis Coupe 3.8 R-Spec for the purposes of this review. Thanks to the guys at TrackDaze for yet another well-executed HPDE event.